NEW ORLEANS – The hay is in the barn and the entries are in for the 2018 NAIA Outdoor Track & Field Championships, set to take place this weekend in Gulf Shores, Alabama. We combed through the numbers and based on our calculations, big things could be in store for the Wiley (Texas) men and the British Columbia women. Both of those programs are predicted to win their first outdoor team title in program history. 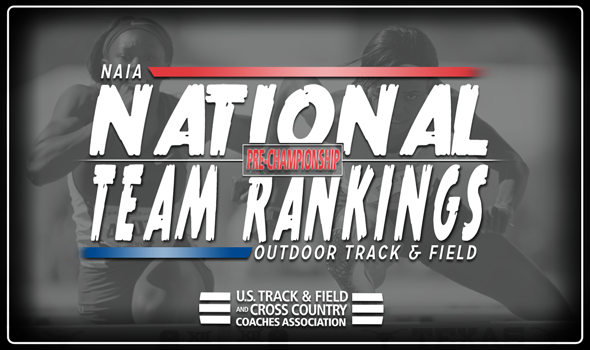 Remember: These rankings only take into account accepted entries into the 2018 NAIA Outdoor Track & Field Championships. Wiley (Texas) jumped to the No. 1 spot based on its absurd amount of national top-10 marks. The Wildcats hold 11 entries that are ranked in the top-10 nationally, including six top-ranked entries: Oraine Palmer in the 100 and 200, Marbeq Edgar in the 800, Lafranz Campbell in the 110 hurdles and the 4×100 and 4×400 relay teams. Indiana Tech sits No. 2 in the Pre-Championships Rankings and will look to rain on Wiley (Texas)’s parade. The Warriors have won three national team titles with the last one coming in 2016. Indiana Tech hopes to make the most out of 11 entries that are ranked in the top-10 nationally, including seven that are ranked in the top-5. Don’t rule out defending champion British Columbia, which sits third. The Thunderbirds will rely on their strong distance corps to get the job done once again. John Gay enters the meet ranked No. 1 nationally in the both the steeplechase and 5000, while he’ll be joined by three other athletes that hold top-3 Billings this late in the season. Doane (Neb.) and Tennessee Wesleyan are ranked No. 4 and No. 5 in the final index of the season and appear to be strong candidates to make the podium. British Columbia lurked in the shadows all season long and jumped into the forefront when it mattered most. The Thunderbirds own 12 entries that are ranked in the top-5 nationally, including two by Natalia Hawthorn, who is No. 2 in the 1500 and No. 4 in the 800, and two by Enid Au, who is ranked third and fourth in the 5000 and 10,000, respectively. Defending champion Wayland Baptist sits second in the Pre-Championships Rankings with 11 entries ranked in the top-5 nationally. The Pioneers, who have won a staggering 40 individual championships in meet history, could definitely add to that total with three women ranked atop their respective events: Devin Johnson in the 200, Karis Parker in the 100 hurdles and Tiona Owens in the triple jump. Indiana Tech doesn’t have any top-ranked entries, but has 16 listed in the top-10 nationally. The Warriors went back to back in 2013 and 2014, then finished runner-up in 2016 and 2017, so you better believe they’re hungry to get back atop the podium. Hastings (Neb.) and Southern-New Orleans (La.) round out the top-5 of the rankings and should be well-positioned to contend into the final day.